Edinburgh Dental Specialists are pleased to offer a unique mentoring and advice service to all our dental colleagues. Email us with a question, including any relevant x-rays, and get a second opinion from one of our specialists within hours. We triage your question and then direct it to the relevant specialist – problem cases, radiographic findings, second opinions, endodontics, prosthodontics, periodontics, technical lab questions, aesthetic concerns, pre-referral questions – really anything where you think a second pair of eyes would be helpful or if you just want to discuss something. We are happy to provide this service to you completely free of charge and look forward to helping you in any way that we can. This particular case was recently received, the request was; to offer advice on which type of crown lengthening procedure would be most appropriate for tooth 22, electrosurgery being the preferred option. 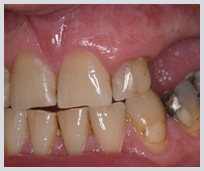 The picture was e-mailed to us and Dr Coli (prosthodontist/periodontist) was able to respond on the same day advising that, in this tissue type, stability following gingivectomy would be unpredictable unless bone was removed to recreate the biological width above the proposed gingival margin. Further explanation and theoretical discussion followed. "The views/opinions are based upon the information provided and also upon due consideration of the general principles involved in patient management and treatment planning. An opinion given in this way cannot, and is not intended to, remove the need for a full and comprehensive clinical examination, discussion with the patient regarding the treatment options and the formulation of a final treatment plan. Whilst every reasonable effort will be made to ensure that the advice of opinion that is provided is based upon the general principles of clinical management, Edinburgh Dental Specialists nor any individual clinician cannot accept liability for any loss or damage that may arise. Clinicians are reminded of the duties, obligations and responsibilities in the delivery of patient care and that final responsibility rests with them for the decisions and actions taken in the delivery of care for their patients". Copyright © Edinburgh Dental Specialists . All rights reserved.